In 2010, the American Trucking Association decided to add a roof terrace to its headquarters in Washington, D.C.
Before this could commence, an investigation of the existing roof structure was required, to determine if the revised loads could be supported. CCL was commissioned by Baker Concrete to carry out a full evaluation of the existing structure, including the status of the post-tensioning tendons, and to propose strengthening options. As a result of the study, further strengthening was deemed to be required. Two options were considered: external post-tensioning, and jacketing with post-tensioned tendons. CCL evaluated each beam independently and found that in most areas additional strengthening using jacketing with PT was adequate, which had significant cost-saving implications for the client. In one area only, replacement of the existing beam was required. Space around the beams was limited. In order to overcome this problem, CCL proposed a bespoke PT solution and designed special multistrand anchors to work with unbonded tendons. This facilitated access, reduced repair work and kept costs to a minimum. 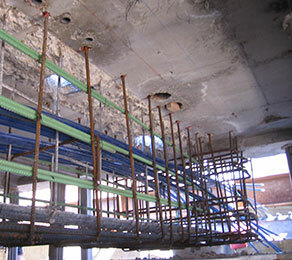 The beams were tied into the existing slab to benefit from the full concrete section, the beams were tied into the existing slab, and the slab-column connection was checked to ensure that the new anchors could be housed and the force transferred back to the columns. As parts of the tendons would remain exposed, the anchorages were designed to be fireproof and encapsulated, to meet fire and durability requirements. CCL’s careful evaluation and its intelligent, cost-effective solution made efficient use of the existing structure, and minimised disruption and cost.